The provocative work that caused a global sensation by meshing ancient Islamic art and modern political angst is coming to the United States with an exclusive engagement at the Yeshiva University Museum (YUM) this fall. In Threatened Beauty, American-born, Israel-based artist Andi Arnovitz deconstructs Persian, Anatolian and Uzbek textiles, rugs and ceramics, to reflect on today’s nuclear arms race and political turmoil – and the tension between present-day Iran and the tradition of beauty it represents. 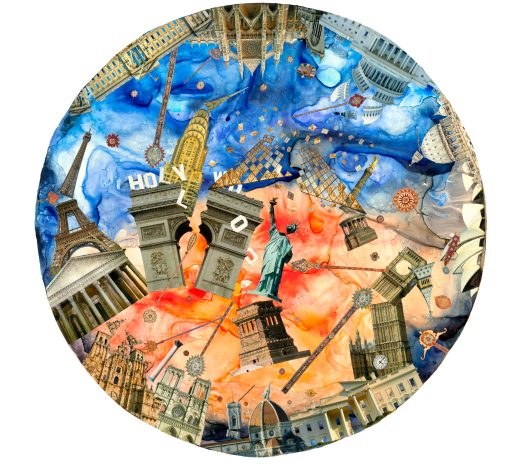 By manipulating traditional Islamic imagery into 35 lush circular collages and watercolors, Arnovitz also sensitively expresses deep-seated personal fears and global concerns about fanaticism, erosion of women’s rights, and extremist violence. Interwoven in these pieces are references to ancient Persian folklore, fables and fantasies, as well as subtle and not-so-subtle acknowledgments of contemporary politics, disasters and current events. Among the works on display is Making Yellowcake, a watercolor and collage work inspired by yellowcake, a type of uranium concentrate powder which is necessary to create fuel for nuclear reactors. The image is based on a facility at Isfahan, Iran, which operates four nuclear reactors. Another piece, All That Is Precious, was inspired by the destruction in March 2001 of two monumental 6th-century statues of the Buddhas of Bamiyan at the hands of the Taliban in Afghanistan. “Threatened Beauty” will be on display at the Yeshiva University Museum from September 6-January 10. For more information, click here.